"We acknowledge receipt of your letter dated September 20, 2018 addressed to Honourable Chief Justice, which has been referred to the Chief Justice for response," read the letter dated September 28, 2018 and signed by Ms Anita Tshuma, the registrar of the Constitutional and Supreme Court. "The Chief Justice has requested us to inform you that your complaint raises issues relating to the ethical conduct of the judicial officer concerned, which will need to be investigated by the Judicial Ethics Advisory Committee. "You will be advised of the outcome of the investigations once they have been completed." 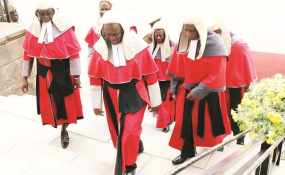 In a letter wrote to Chief Justice Malaba in September last year, Mr Moxon said he had information of Mr Kanyekanye's links with Justice Bere.